This story is so stinking cute. It's about a little homeless calico cat and a European Lynx becoming best friends. Apparently they are now inseparable. 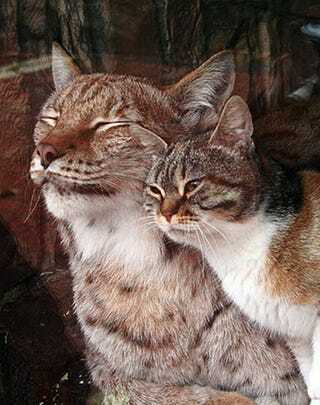 Their friendship began after the poor little homeless kitty wandered into the Lynx's enclosure at the Leningrad Zoo in search of food. Their attachment was so strong, that the zoo decided to adopt the cat so the two could live together. Check out the adorable video of the pair.